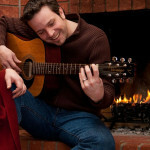 The only downside to a wood burning fireplace or stove is the ash that remains after the fire. But having the right equipment and techniques for fireplace ashes cleaning can eliminate the mess and fuss. 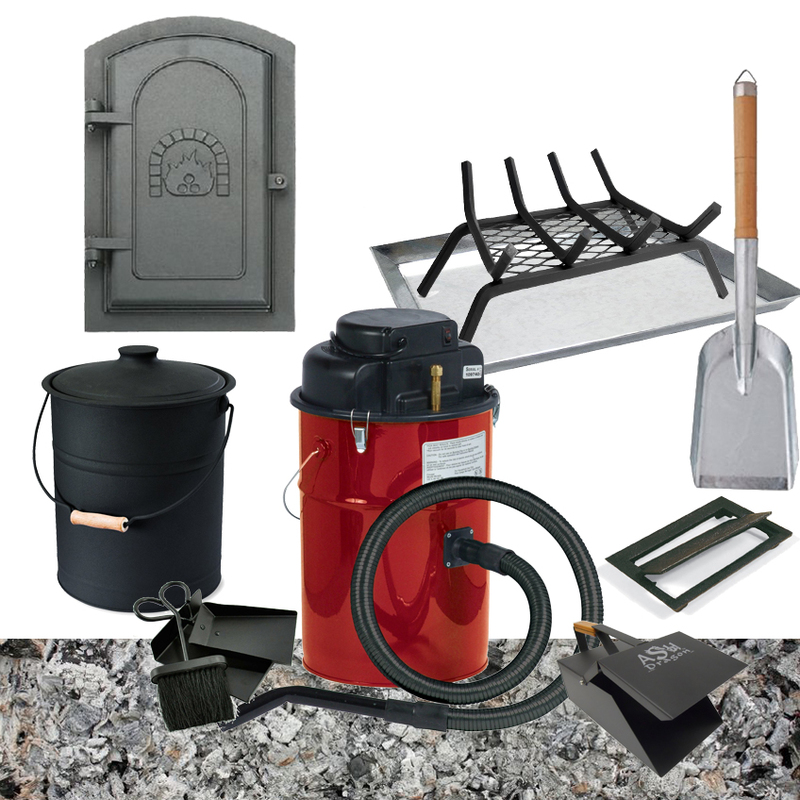 Thus the need for Ash vacuums, ash tray pans, ash broom and shovel sets, Ash Dragon, lidded ash buckets, fireplace clean out doors and ash dumps, and ember grates. Ash Vacuums are the most convenient and efficient way to remove ashes from a fireplace, wood stove or grill. They have heavy duty filters and vacuum bags that capture all of the ash and soot for a dustless cleanup. Many, like the Shop-Vac Ash Vacuum are designed only for cold ashes. Other brands, like the Cougar, Cheetah II and the PowerSmith Ash Vacuums will take warm and cool ashes. 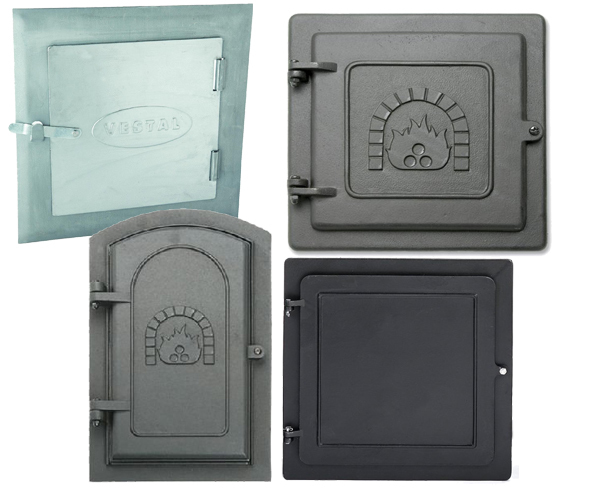 TIP: Buy the filters and replacement bags when you get your ash vacuum. .
Fireplace Ash Trays or Pans simplify fireplace ashes cleaning. They fit under the fireplace grate and catch the ash. To clean out the ashes, first lift up the grate. Then slide out the ash-filled pan. 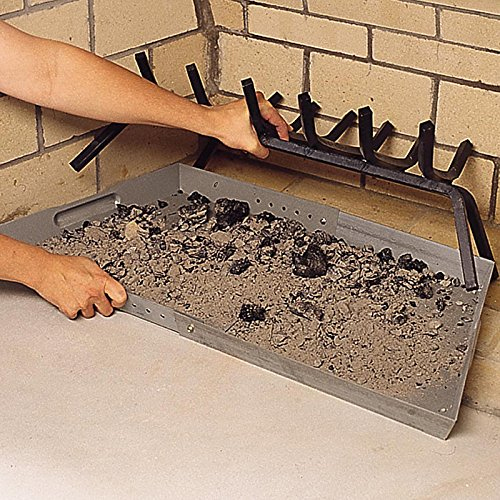 These ash pans are most helpful for folks who clean out their fireplace ashes frequently. 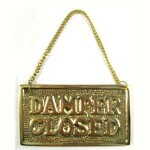 If you are the type who doesn’t remove the ashes until you absolutely have to, this will not be of much help for you. TIP: If you decide to get one, measure first. 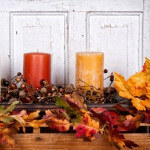 Make sure it is wide enough and deep enough for your fireplace grate to sit inside it. Ash Broom and Brush Sets are great for keeping a tidy, ash-free hearth. For small clean-ups, you can use the shovel and broom from your fireplace tool set. 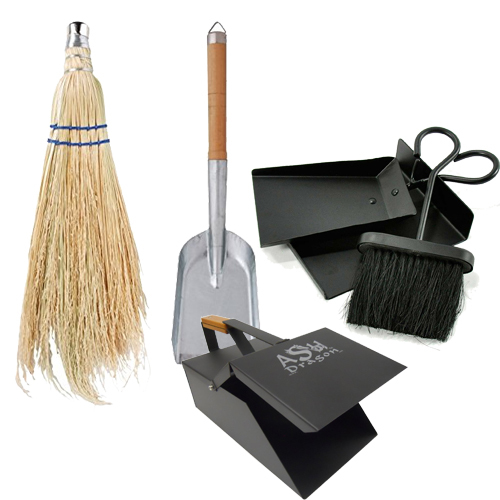 But we also like the handiness of these ash broom and shovel or ash dust pan sets. TIP: The Ash Dragon lets you do the job one-handed, without scattering ashes or dust! Lidded Ash Buckets are the correct intermediate destination for ashes that have been removed the the fireplace. One hot ember within a bucket of cold ashes can reignite and start a fire if it has an air supply. Thus the need for the lid. 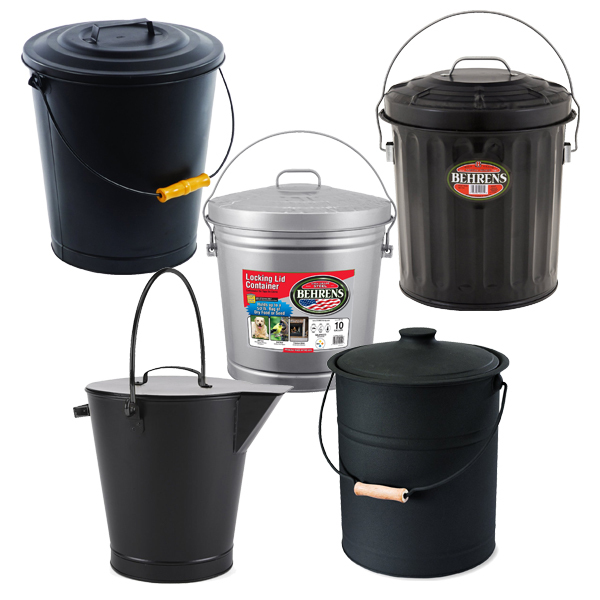 From ash buckets handsome enough to sit on the hearth to the purely utilitarian, there is more of a range in styles than you might expect. TIP: Two features we recommend are a side handle that makes pouring out the ashes easier and a wooden hand grip that makes carrying a full bucket easier. Fireplace Clean Out Doors and Ash Dumps are two ways to remove ashes from the fireplace without having to carry them through the house! 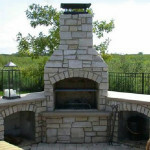 Clean Out Doors typically are inside the firebox and open to the outside of the house or a garage. They are constructed of steel, cast iron or aluminum. For fireplace ashes cleaning, first open the clean out door. 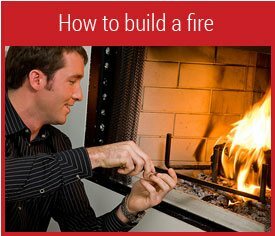 Then shovel out the ashes from the outdoor side of the fireplace. 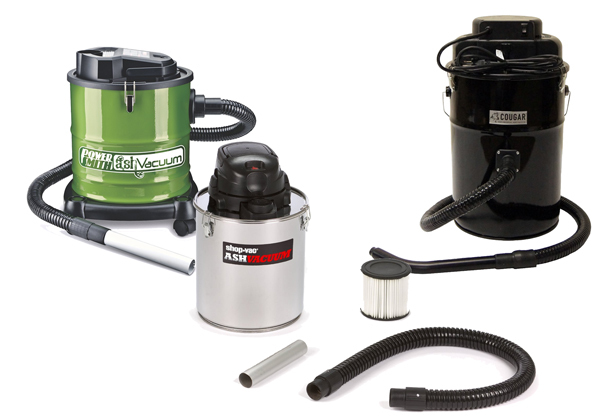 Clean out doors are available in the following standard sizes: 8″ x 8″, 10″ x 8″, 8″ x 12″, 12″ x 10″, 12″ x 12″, and 16″ x 12″. Ash Dumps, on the other hand, are located in the floor of the firebox (replacing a brick) and, when pivoted opened, drop the ashes into a space below the fireplace, such as a basement. 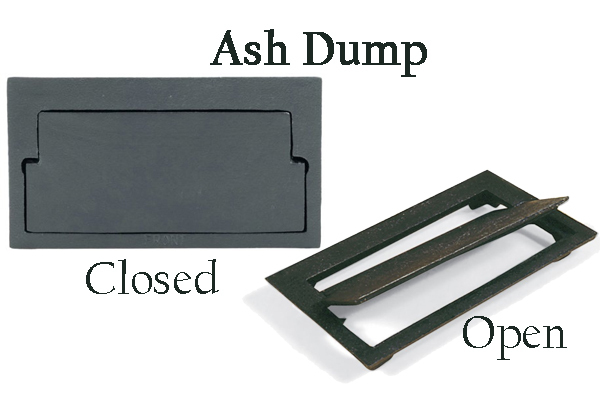 Ash dumps are approximately the size of a brick, ranging from 4″ x 9″ to 5.5″ x 9.75″. TIP: If you need to replace an existing clean out door or ash dump, first measure the existing one. Then order one that size. Ember Retaining Grates reduce ash cleanup by helping you burn the firewood more completely. The grid keeps small chunks of wood on the grate to burn. 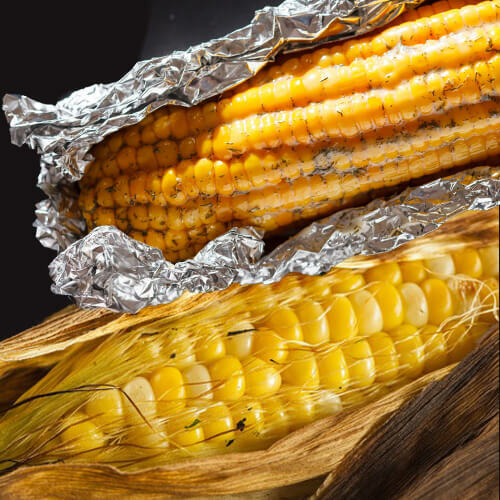 Instead of those small chunks falling through the bars of the grate, they become fuel. You have not only more heat from the same amount of firewood but also less ashes to clean up. 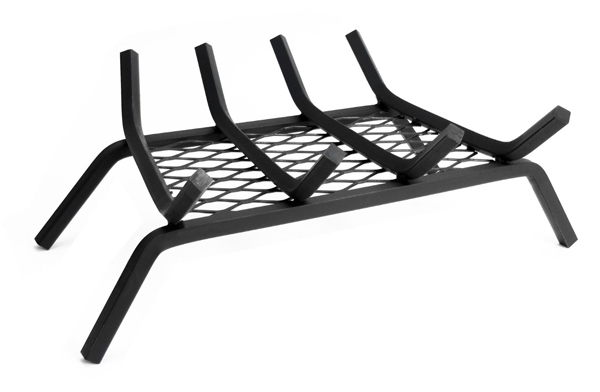 TIP: If you have an existing fireplace grate without the screen mesh, you can retrofit it with ember mesh. 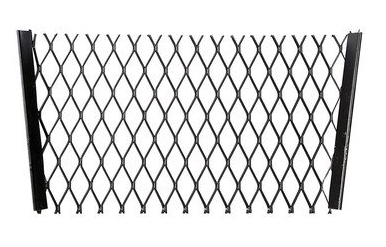 First measure your existing grate before ordering the ember mesh. 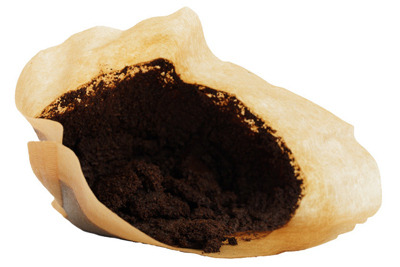 Finally, you can recycle your used, wet coffee grounds when you clean out the fireplace ashes. Sprinkle the coffee grounds on the ashes. They will hold down the ash dust as you use your ash vacuum, fireplace broom or Ash Dragon to gather the ashes. Now, what to do with those ashes?